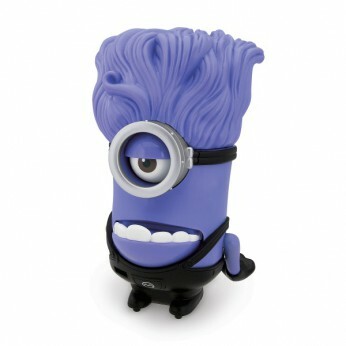 Deluxe Action Figure Chomping Purple Minion! Insert the rip cord and pull to rev him up. His jaws snap open and shut as he zooms along any smooth surface! 12cm tall. This toy costs approximately £12.99 (for the latest and best prices make sure you check our retailer list for the Despicable Me 2 Deluxe Action Figure Purple Minion above). In our review of Despicable Me 2 Deluxe Action Figure Purple Minion we classed it as being suitable for ages 3 years, 4 years, 5 years but recommend you check the manufacturer specific advice before purchasing.